For the past 34 years, Representative Byron Rushing, (D – Suffolk), with the support of the Massachusetts Commission on Indian Affairs, has introduced and re-introduced legislation, every two years, to set up a commission to recommend changes to the Massachusetts State Flag and Seal. And every two years since 1984, that legislation has been bottled up in committees, and never passed. 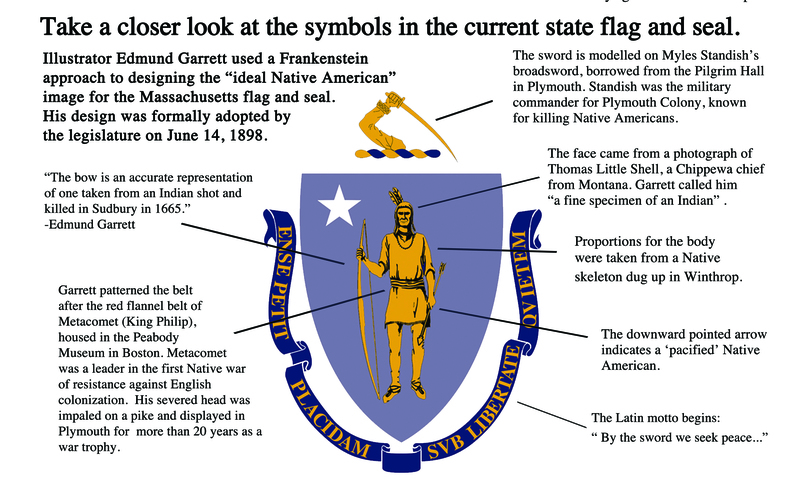 The bill would set up a commission to include state legislators and representatives of Native Nations within the borders of Massachusetts to investigate changes to the state flag and seal: the recommendations of that commission would have to be approved by the legislature in order to change the current state flag and seal. In order to document relevant history for state legislators who may wish to work toward the passage of this long stalled legislation – and for anyone in Massachusetts concerned about the representation of a Colonial broadsword suspended over the head of a Native American man as the official symbols of Massachusetts – I have researched archives provided by the Secretary of State and State Library special collection and at the Statehouse in Boston, where documents pertaining to the state flag and seal are held. 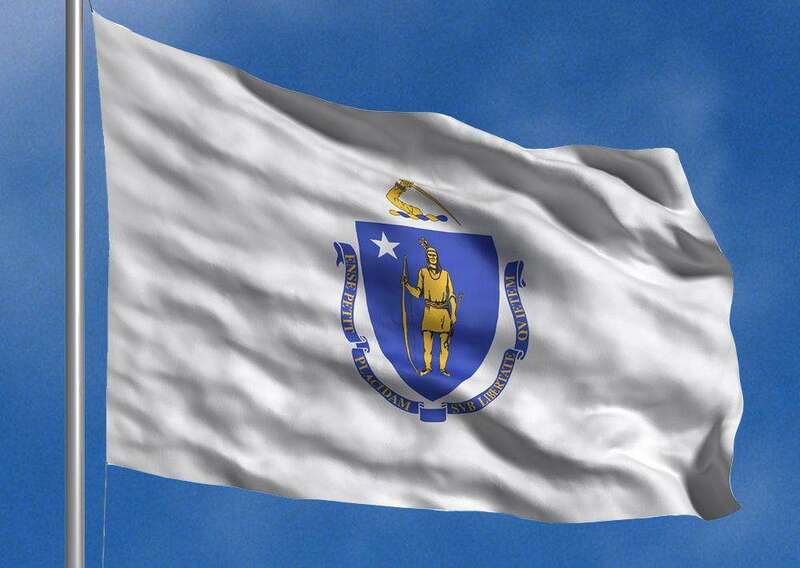 For many years, the state flag and seal of Massachusetts has been a source of controversy. It is seen by many Native people, and by other residents as an offensive symbol of white supremacy and the historical oppression of Native people in Massachusetts and our nation as a whole. The contemporaneous records of the deliberations of the state legislature at key points when the Massachusetts seal was first adopted and subsequently changed are scant, but here is the history as I have found it. Unlike the motto, the state seal has been changed on multiple occasions. The General Court established a commission to consider a state seal in 1775. The design chosen in 1775, while the Revolutionary War was raging, was engraved by Paul Revere, and depicted an Anglo-American man holding an upraised broadsword in his right hand, and a copy of the Magna Carta in his left. Five years later, Revere was again commissioned to engrave a new Massachusetts state seal, to be chosen by committee and approved by the Council and Governor John Hancock. 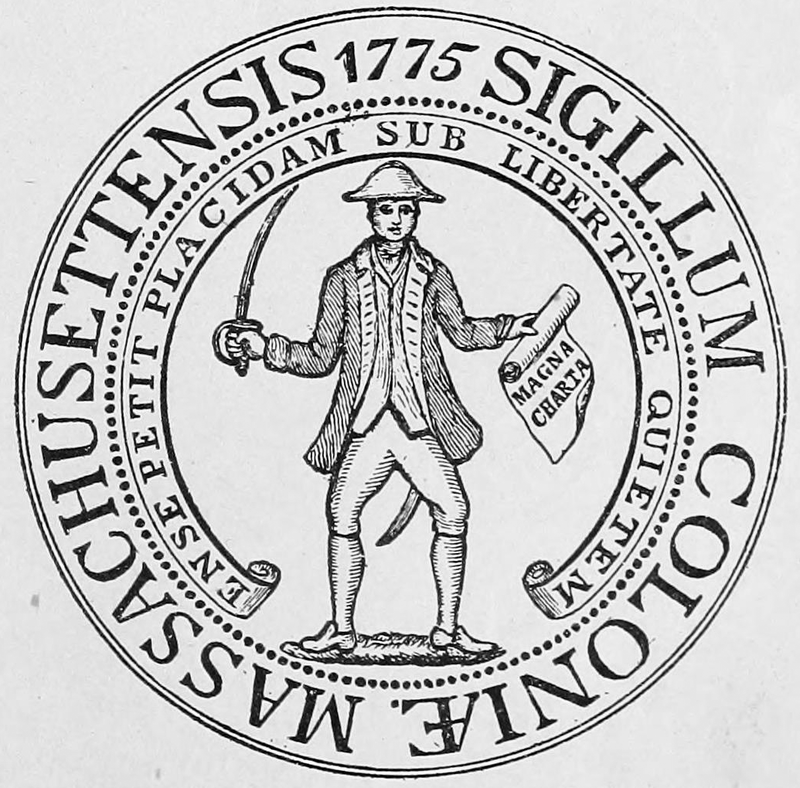 With the Revolutionary War over and the American colonies victorious, the state seal adopted by the new state of Massachusetts in 1780 was modeled directly on the original 1629 seal of the Governor and Company of Massachusetts Bay – which featured a Native American man (generally considered to be an Algonquin, though not necessarily a member of any specific tribe native to Massachusetts) standing with a bow in his left hand, and a down-turned arrow (signifying a peaceable, or pacified, Native American) in his right hand. The bitterness of that particular motto and seal was perhaps lost to the proprietors of the Company of Massachusetts Bay, though not to history. Granted only a decade after a general plague (of smallpox, or some disease of European origin to which the Native population held no immunity) had so decimated the once populous lands and villages of Massachusetts’ original inhabitants that, as historian Edward O’Donnell writes in The Past Lane: “We get a sense of the scale of devastation from a vivid account recorded by a Captain Thomas Dermer. He traveled from present day Maine to Massachusetts in 1619, and when he arrived he found, ‘ancient plantations, not long since populous, now utterly void; in other places a remnant [of the Native population] remains, but not free of sickness.’” Mortality estimates for Native tribes of coastal New England range from 50% to 90% from this one epidemic. So few tribal members survived in the coastal regions of the Northeast that their dead remained unburied in many areas. When some historians refer to the early settlements of the Massachusetts Bay and Plymouth Company as colonies “built on bones” they do not exaggerate much. While the words “Come Over and Help Us” pictured issuing from the Native American man’s mouth in the original seal of the Massachusetts Bay Company may have been intended as a reference to the supposed Christianizing impulse of the well-to-do Puritans who were the principals of that commercial enterprise, in fact, very little proselytizing among the indigenous tribes was attempted by the Puritans. Rather than coming over to help the Natives to a foreign religion, the Puritans contented themselves mainly with helping themselves to the Natives’ liberty, their lands, and, over time, their heritage. Though the pleasant story of Wampanoag sachem Ousamequin’s (Massassoit) succor of the starving Pilgrims in the nearby Plymouth Bay Colony is generally where Native studies begin and end in the Commonwealth’s public schools today, the less savory sequel of his eldest son Wamsutta’s death immediately after being taken captive at gunpoint by Major Josiah Winslow and held for three days at Duxbury in 1662 on suspicion of rebellion is less well known. Wamsutta’s death was the proximate cause of the outbreak of war led jointly by his younger brother Metacom (King Phillip to the colonists), his sister-in-law Wetamoo, and many other Native leaders of Massachusetts in 1675, which resulted in the most grievous per capita loss of life of any war fought by the English or their descendents on this continent ever since. However, with Metacom’s death and beheading in 1676, the Native people of the Commonwealth suffered far worse in defeat than the colonists had in achieving victory. The Native people of Massachusetts were reduced at that time to peonage and lost rights or title to the all but a tiny remnant of their lands. During the winter of 1675, thousands of Native people, mainly Christianized “praying Indians” from towns like Natick, were abandoned to the elements at an “internment camp” at Deer Island in Boston Harbor, where hundreds froze to death. Two hundred and seventy years before the infamous Korematsu v. United States decision legalized the internment of Japanese Americans in camps during World War II, (a decision ultimately repudiated by the Supreme Court in 2018), Massachusetts was blazing the trail for the illegitimate removal and internment of noncombatant Native peoples in North America. Many of their survivors were sold into outright slavery locally or in the West Indies. The heads of Metacom and Weetamoo were placed on pikes on the town commons in Plymouth and Taunton, respectively. Metacom’s skull remained on display for decades. Starting in 1689, Massachusetts placed a bounty on the scalps of Native men, with the price originally set at 40 pounds sterling. By 1722, the Massachusetts colonial legislature had raised that bounty to 100 pounds sterling for the scalps of Native men over the age of 12, half that for the scalps of Native women and children. Native scalps were displayed in local museums such as the Peabody in Boston until the Native American Graves Protection and Repatriation Act was passed by the federal government in 1990. When the royal charter granted by Charles I to the Massachusetts Bay Company was revoked in 1684, it was replaced by a series of Royal seals and the seals of Royal Governors, with a brief reprise of the Bay Company seal from 1689 to 1692. (The two-sided seal used by Massachusetts Governor Edmund Andros from 1684 to 1689 featured a Native American and an Englishman kneeling together in front of the King James II.) On August 5th , 1775, the committee appointed to consider, “What is necessary to be done relative to a Colony Seal,” made up of Governor’s Councilors Major James Otis and Dr. John Winthrop, along with legislators Major Joseph Hawley, Major John Bliss, and Dr. Whiting, reported: “In Council read and accepted with this amendment viz. Instead of an Indian holding a Tomahawk and Cap of Liberty There be an English American holding a Sword in the right hand and Magna Carta in the Left hand with the words Magna Charta imprinted on it.” This design, with an Anglo-American holding the Magna Carta, was accepted as the Massachusetts seal for five years during the Revolutionary War. But, in 1780, as Massachusetts became a state in the new republic, a subsequent committee was appointed to re-examine the matter of a state seal. Why this committee, made up of Representatives Sumner, Phillips, and Turner, chose to abandon the Anglo-Saxon figure holding a sword and the Magna Carta, and revert to the figure of a Native American man holding a bow and a downward pointed arrow favored by the Puritans of the Massachusetts Bay Company is not clear from the available record. The committee’s reasoning may now be lost to history. Nonetheless, without supporting legislation, the recommendation of this committee was accepted by Governor John Hancock in 1780; with a design by Nathan Cushing. Though the state seal has varied in the details of its representation since, the basics of its design, which now included a Colonial broadsword poised above the Native American’s head, has not changed. The design and its individual elements were formally codified by an act of the legislature in 1885, and has not changed since. Illustrator Edmund Garrett created the enduring design for our present version of the state seal, in close consult with Secretary of State William Olin, and it was formally adopted on June 14th , 1898. According to his report in New England Magazine, Vol 23, (1900-01) “The Coat of Arms and Great Seal of Massachusetts,” Garrett’s method of design including using the skeleton of a Native American “found in Winthrop” for accurate proportions, and the photograph of “a Chippewa or Ojibwa Indian called Es Sence, or Little Shell” as a model for the facial features incorporated on the current Massachusett flag and seal. A fact sheet provided by Representative Byron Rushing’s office notes, “Little Shell was the Chief of the Little Shell Band of Chippewa Indians, which is based in Great Falls, Montana. Though not from a Massachusetts tribe, his portrait was selected because ‘he was a fine specimen of an Indian,’ (op. cit. Garrett).” Garrett modeled the broadsword on the Massachusetts flag and seal after the weapon housed in the Pilgrim Hall in Plymouth that is said to be the sword of Myles Standish. Standish, lifelong military commander for the Plymouth Colony, is noted for many daring exploits of war, including his ambush and killing of four Massachusett warriors at a meeting he called at Wessagusset, present day Weymouth, less than four years after the Pilgrims first sailed into Plymouth Bay. Garrett went to considerable lengths to make certain that the ruffled sleeve and hand he depicted holding that broadsword on the flag and seal were accurate in their period details, particularly in the manner in which the hand grips the sword hilt. “The thumb (is) around the grip rather than extended, and this manner of holding the sword was adapted to cutting rather than thrusting and was peculiarly English.” Seen in this light, the positioning on the state flag and seal of what Garrett conceived to be a replica of Myles Standish’s own broadsword poised as in a cutting motion above the Native American man’s head takes on an overtly belligerent symbolism. The Native American’s belt, Garrett said, he patterned after the red flannel belt considered to be the belt of King Phillip (Metacom), housed in the Peabody Museum. “The bow is an accurate representation of one taken from an Indian shot and killed by William Goodnough in Sudbury in 1665,” Garrett noted. The Native American on the state flag and seal has no quiver, only one arrow, pointed down. Prominent antiquarians and anthropologists of the day, including Rev. Edward Everett Hale, Justin Winsor, and Prof. F. W. Putnam were consulted on the verisimilitude of the design as to what “a Red Man look(ed) like who lived about Massachusetts Bay in Colonial days,” again quoting Garrett They agreed on all details save the Native’s hair style. But Garrett quotes William Wood’s travelogue of 1634 in an attempt to prove that all these gentlemen may have been right about how a local Native might have worn his hair: “Other cuts they have as their fancy befooles them, which it would torture the wits of a curious Barber to imitate.” Finally, Garrett sums up the subject of his labors: “During the progress of the work preparing the seal, many people objected that an Indian did not and should not stand for the state of Massachusetts. That the reputation of the Indian is bad in our country may not be denied, and the writer, who knows but little about him, cannot undertake his defence. Truth it is that many of those who know him best are his greatest foes and detractors (emphasis added). But it must be remembered that Massachusetts takes its name from one of his tribes, that this region was early known as, and was in fact, the country of the Massachusetts, and that this early name finally prevailed. It has come to be associated with the history of deeds and glories so far removed from the poor savages whose birthright it was, that its origin has been lost sight of.” I hope this brief extract of the history of our state seal, so far as I have been able to learn it, may help to some extent recover our sight of the Native birthright of our Commonwealth, and that we may come to a better understanding between our sovereign peoples of the proper means of representing Massachusetts on official documents, state vehicles and the state flag. Even the original charter granted to the Massachusetts Bay Company by Charles I in 1629 noted, “Said Governors and Companye and their successors maie have forever one common seale… and the same seale maie… alter, change, breake and new make, from tyme to tyme, at their pleasures.” In hopes a more harmonious relation may yet be established with the Peoples who first welcomed Anglo-Americans to their shores, from whom we have Helped Ourselves to so much that was rightfully theirs at our arrival, may we work with representatives of the Nation Nations of the Commonwealth to design and adopt a new flag and seal to more justly represent our Common Wealth, and share that vision in harmony with the sovereign Nations who live here still.